A number of people noticed this year that the leaves of ginkgo trees turned bright yellow, as usual, and then suddenly dropped all their leaves literally overnight leaving a golden carpet of leaves around the trees. This is actually pretty normal too, but usually it happens along with a lot of other trees dropping leaves, so fewer people notice. 2016 has been a long warmish fall with no good hard frosts before there was a very cold overnight freeze. What happens is this. The shorter, cooler days stops the production of chlorophyll that ordinarily masks the yellow pigments (carotenoids, xanthophylls) and the leaves turn yellow. This is pretty common for lots of trees. At the base of the leaf stalk deciduous trees form a week place called an abscission zone, and in most trees a bit of back and forth bending in the wind causes the leaf to fall. Gingko makes such a zone, but some of the vascular tissue remains connected and it takes a freeze, forming some ice crystals, to break the residual vascular connection, so after such a freeze, the leaves all fall at once. 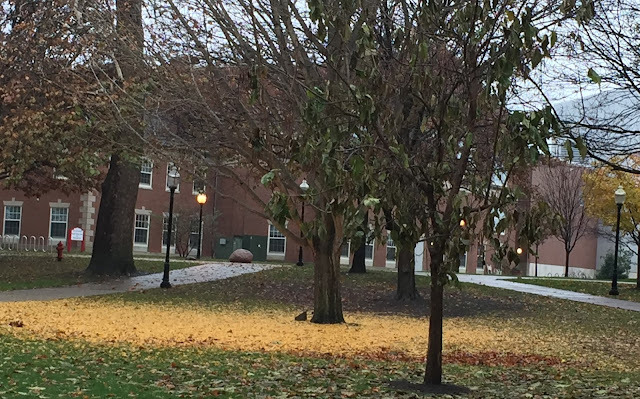 One day ginkgo trees have yellow leaves, the next day the trees are bare and the ground carpeted with ginkgo leaves.